When I was growing up, my mom made a lot of handmade Christmas ornaments and decorations. It was my favourite part of Christmas to play with all the ornaments and rearrange them on the tree. It’s 25 years later, and just this last weekend, my mom was trying to convince me that we need to split up all of our childhood ornaments between my sister, brother and myself. All I wanted to say was, “You can’t split up all those old, tattered memory filled ornaments! They belong on your tree forever!” haha… I guess that sentimental attachment hasn’t gone away, even though I have my own kids, my own Christmas tree and my mom hasn’t put up those handmade ornaments in years! 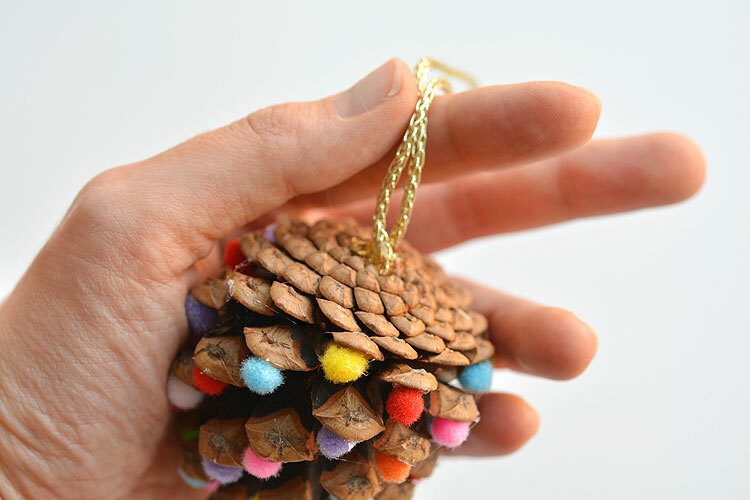 Did you play with the ornaments on your Christmas tree when you were a kid? I swear it was one of my favourite things about Christmas! It’s always been my goal to have a Christmas tree that my own kids can play with too. That means I don’t buy very many designer boring sparkling balls. And I definitely don’t have anything breakable. My tree isn’t very fashionable, and it’s definitely not going to make it into any magazines, but I really hope my kids love it as much as I loved our tree when I was growing up! I know, I know. 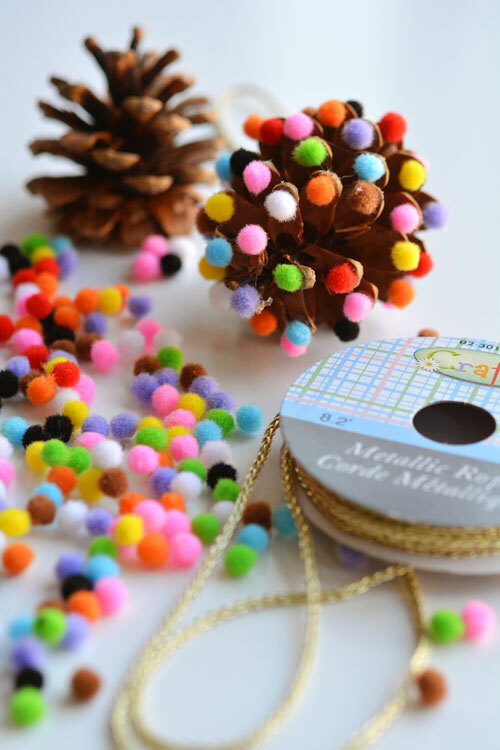 These pom poms and pinecones Christmas ornaments are ridiculously easy! But you know what? They turned out surprisingly beautiful, and they are going to look amazing on our tree! And the absolute best part was that both my 3 year old and 5 year old could help make them. They are pretty much fool proof, even for a three year old! These pom poms are really small. 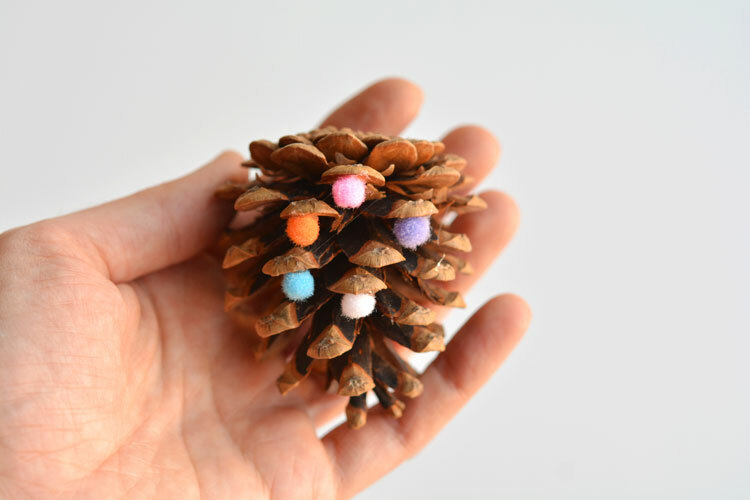 I got them from the dollar store and they were the perfect size to fit in the pinecones. 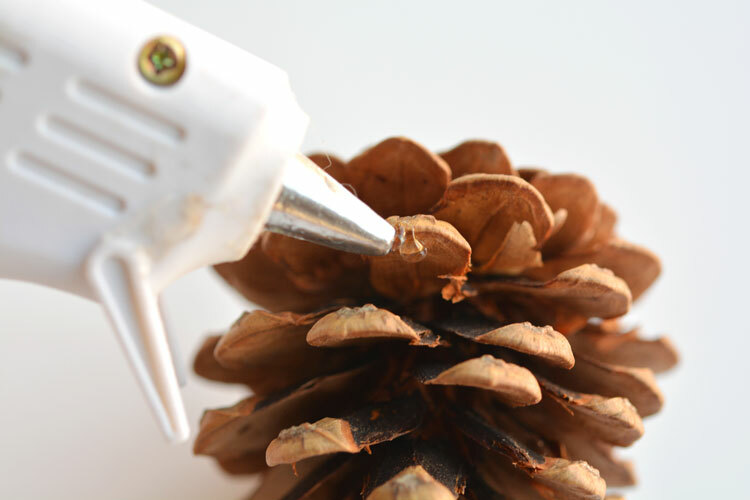 Start by adding a small glob of hot glue to the underside of the pinecone “branches”. 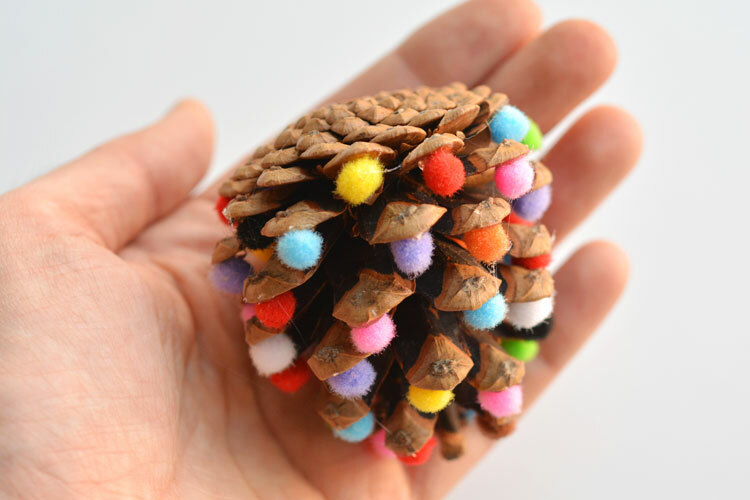 Then stick a tiny pom pom onto the dab of glue. 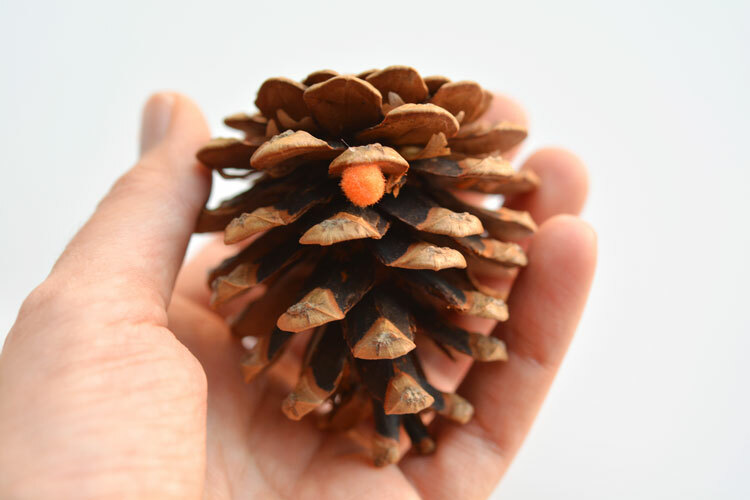 Repeat for all the the pinecone tips. 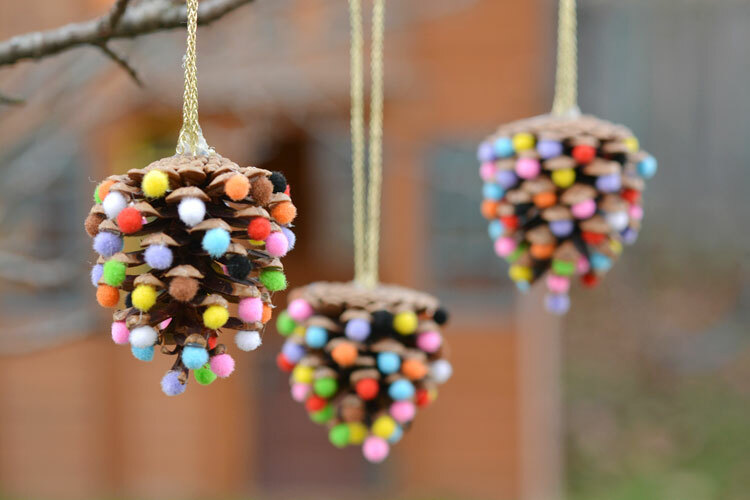 The little pom poms look just like ornaments hanging from a tree! 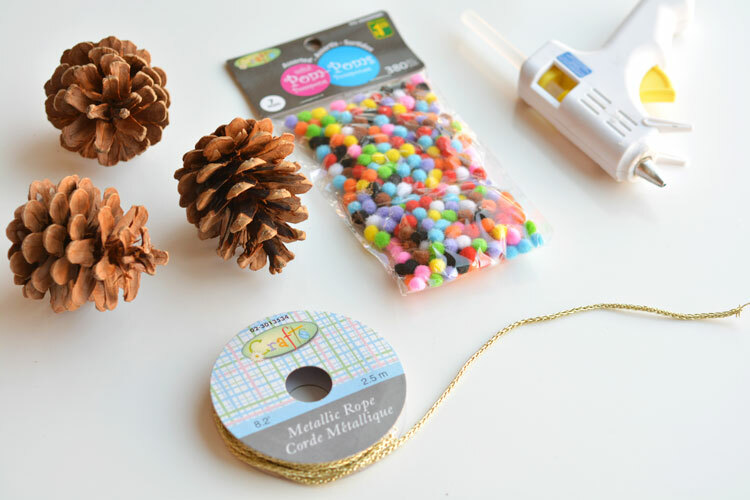 Then take about 11″ of string or ribbon and hot glue it to the top of the pinecone. We used this gold chain looking ribbon from the dollar store. I was pretty generous with the hot glue and they feel pretty secure. Maybe I’m a risky mom here, but I let both my three year old and five year old use the glue gun. They were sooooo excited and they actually did really well with it! 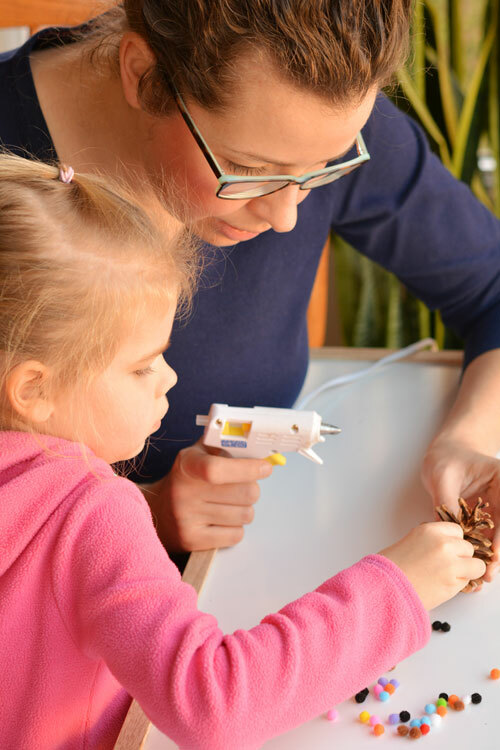 It’s just one of those cheap, tiny glue guns, so it doesn’t get very hot. I had to peel away a lot of glue strands when they were finished, but they cleaned up really well. And now my girls are going to be so excited to hang them on the tree! It’s still way too early to put up the Christmas tree, so I had to improvise a little bit for the photos. Yup, that’s the kids swing set in the background of this next photo! And I never realized it, but we don’t have any evergreen trees on our property. So this next photo uses a branch that hangs over our fence by about 18″. Of course our neighbour walked out into the backyard at exactly the same time I was shooting these photos. She probably thinks I’m a bird watcher now. But on the bright side, the branch gives a nice preview of what these ornaments will look like on the Christmas tree. They’re really simple, but I love how they look natural and quirky at the same time! 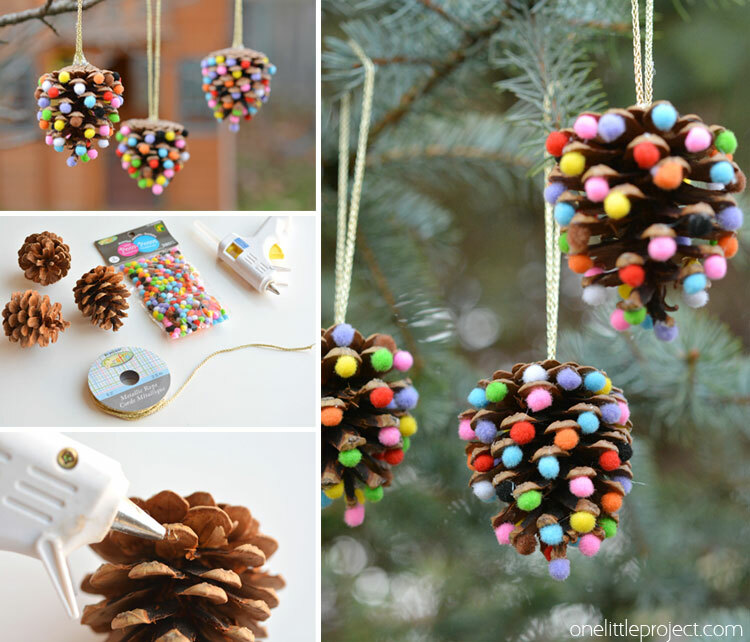 These pom poms and pinecones Christmas ornaments are so easy! 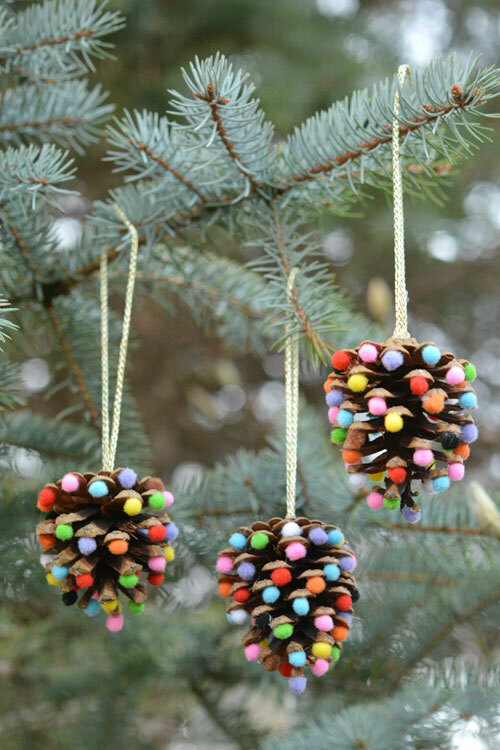 They’re a great craft for both kids and adults and they end looking surprisingly beautiful! 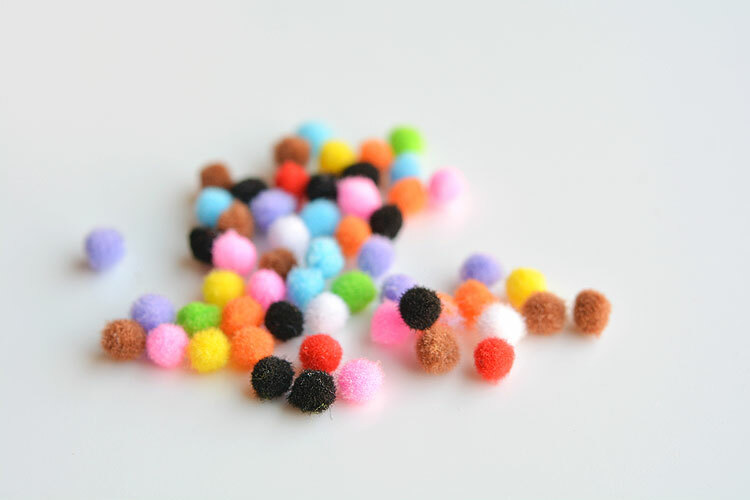 You can make them multi-coloured like ours, or you can try using single coloured pom poms to give a more uniform look. They’re a great little ornament that will last for years!